Dezeen promotion: two shades slot together to make up these pendant lights, recently launched by Canadian lighting brand ANDlight. Originally developed by designer and brand co-founder Lukas Peet in 2010, the Spotlight Volume lamps were launched by ANDlight at the ICFF furniture fair in New York last month. They were shown alongside the company's Slab and Button collections, both also designed by Peet, and the Pipeline range, designed by fellow ANDlight co-founder Caine Heintzman. Similar to the Spotlight Volume, the Pipeline family is made up of a linear LED pendant system and can be built in a "virtually unlimited" number of compositions. 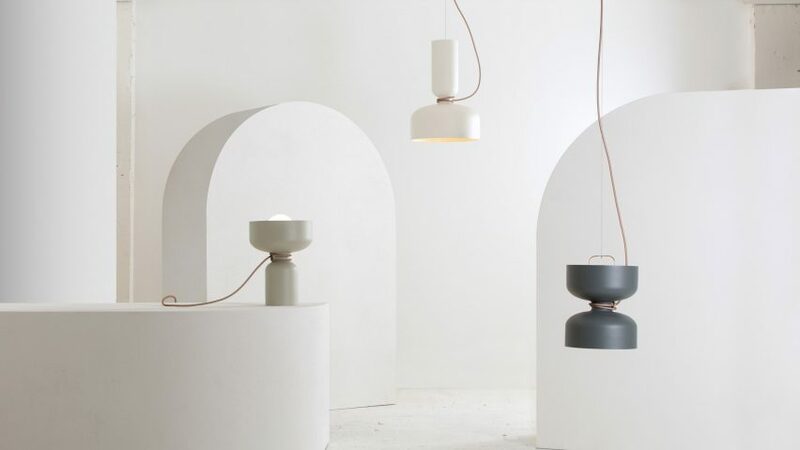 The Button series features a pendant light that – aptly – looks like a huge button and can be articulated in any direction, while the Slab Series is made up of a large flat panel covered in sound absorbing fabric. Four shades of different shapes and sizes feature in the Spotlight collection. Fixed in pairs to LED light points, the shades point in opposing directions. and floor area," said ANDlight. Two of these shades have a long and narrow shape – one shorter than the other – while the other two have a wider dome shape. In total, they can make 16 configurations. Peet slightly tapered the lamps to create a neck at the centre where the lights slot together. Long electrical cord knots around the middle. The draping cord appears to hold the lights, but they are actually suspended from a one-millimetre-thick air craft cable that is intended to be barely visible. The lights feature a textured, matt powder coat finish and are available in different neutral shades including Sage, Avocado, Vanilla and Butter. The lights can also be used as floor lamps, while the shades can be used separately as ceiling lights. Peet and Heintzman founded ANDlight in 2013, along with Matt Davis. The trio are based in Vancouver and do all of the design work in-house. They showed their collections at ICFF from 21 to 24 May 2017, as part of the NYCxDesign festival.